Traditionally, soaps are made from several oils blended to balance cleansing/moisturizing/and lathering properties. 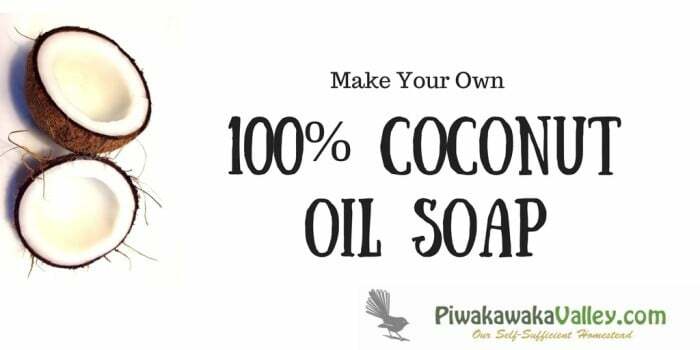 In the soap making world one of the well known “rules” is that a soap should never be made of more than 30% coconut oil because it’s so effective at breaking up oil/grease that it can be drying to use. For a bar soap for personal use this is a bad thing, for cleaning things like clothes, it is fantastic! 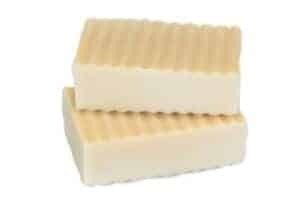 For skin care we tend to use a goats milk soap. Below is two recipes, one for a 0% superfatted coconut oil soap to use purely to make your own washing powder. The second is a 20% superfatted pure coconut oil soap – basically the 1/4 moisturizing cream, without all the extra cruddy chemicals and processing that goes with it. A mold to pour the soap into – I like my silicon soap tin. 700g/24.6oz coconut oil – if you are given the choice you want the normal 72F melting point one, not the 91F one. Directions – Put on rubber gloves and eye protection. Slowly pour the lye into the water, never the water into the lye, as it spatters and is dangerous. Be careful not to inhale the vapors – they stink and they burn and I am guessing they ain’t good for you! Mix the sodium hydroxide very carefully with the water until dissolved, it does heat up so just watch yourself. Set it aside to cool for a while. While the lye solution is cooling melt the coconut oil gently in a pot. Ideally, you would aim for both the oil and the lye solution to be around 40 degrees Celsius – I never use a thermometer, I just guess that it is a comfortable warmth. PLEASE DO NOT check the temperature of the lye with your finger!! Just feel the outside of the bowl, it should be comfortably warm. Once both mixtures are about the same temperature, get your spatula and mold at the ready, flick the stick blender on in the oil and slowly & carefully pour in the lye solution. Continue to beat with the stick blender until “trace” which is when it thickens and goes the consistency of instant pudding. It can take up to 5-8 minutes, or as little as 2-3 minutes, just watch it closely. Once you have hit that point, put down the stick blender and pour the mixture into your mold. Sit your soap aside to cool. You may like to sit your mold in a roasting dish or similar as apparently with pure coconut oil soaps sometimes it can overflow and volcano out of its mold as it continues to heat up over the next few hours – I have never had this problem, but it is up to you, don’t say I didn’t warn you! Unlike other bars which need to harden for 24 hours before being cut, coconut oil makes a very hard bar that will be difficult to cut if you let it dry too long. Cut as soon as it’s cool and firm. In an area with good air flow, place bars on a rack/tray with about an inch of space between them. Allow them to dry out and harden for another few days. Though you can try your first bar after a couple of days for laundry, it’s best to let them sit for 2-3 weeks to let the conditioning properties fully develop and the lye to fully react out of the bar if you want to use it on your skin. This recipe is superfatted to a whopping 20% which leaves it super moisturizing and lush. 700g/24.6oz coconut oil – if you are given the choice you want the normal 72F melting point one not the 91F one. Follow the above directions the same, but you can add 5ml of your fave essential oils during the beating. Just be aware some oils greatly speed up the setting times, vanilla for example. I have had more than one batch set in the bowl, so be ready to move fast!! If you are interested you can check out my recipe for homemade laundry powder and home made laundry liquid soap. Do you make your own soap at home? Ar you keen to try? Let me know how you get on!